Don't Mess With Chechnya: President Kadyrov Spars Ruslan Chagaev! 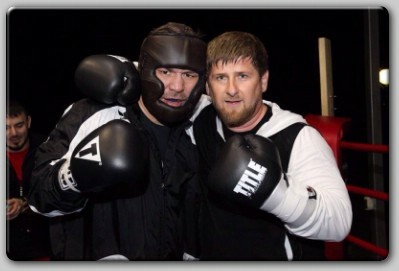 Home / Boxing News / Don’t Mess With Chechnya: President Kadyrov Spars Ruslan Chagaev! Don’t Mess With Chechnya: President Kadyrov Spars Ruslan Chagaev! Former world heavyweight champion Ruslan Chagaev is wrapping up training camp for his July 6 WBA championship bout against Puerto Rican veteran Fres Oquendo on Grozny, Russia. The "White Tyson" has done most of his preparation in the Chechen capital training not only with head coach Artur Grigorian and his manager Timur Dugazaev but also with a "political heavyweight": Chechen President Ramzan Kadyrov, who is a huge boxing fan and used to be a decent amateur fighter himself. Kadyrov is one of the main factors of the world title fight landing in Chechnya. The President and his government support the promotion and are turning Grozny into a huge boxing ring for the event. "We have 50 feet high posters and banners all over the city plus huge sandbags, ring ropes between streetlights and many other spectacular advertisements", says promoter Timur Dugazaev. "This will be the biggest boxing show in the world. 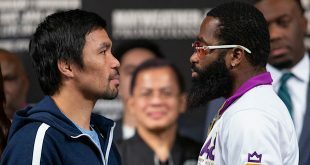 We have Michael Buffer coming in as ring announcer and I am pretty sure that even he will say that he has never seen anything like that - despite his 30 years experience and all the huge Klitschko shows he worked on." While the city is being decorated for the big event, President Kadyrov himself enters the ring with Chagaev to do a couple of sparring rounds and give "his" champion important advise. "I may not be the best boxer in the world but I know where you have to hit somebody", says Kadyrov with a smile. Chagaev was born in Uzbekistan but has been "adopted" by the Chechen government until their own fighters will be ready to fight for world championships. Ruslan Chagaev held the WBA heavyweight title after dethroning "Russian giant" Nikolay Valuev back in 2007 and actually never lost the belt in the ring. "They just took the championship from me and now I am taking it back", says Chagaev. 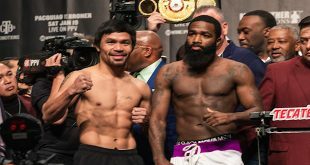 Following his title reign the 35-year-old southpaw lost to Wladimir Klitschko (in June 2009) and Alexander Povetkin (in August 2011) but is now on a five fights winning streak which brought him back to the no. 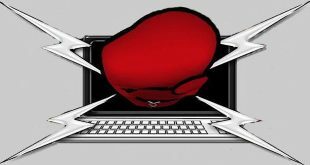 3 spot in the WBA world rankings with the chance to fight no. 4 rated Fres Oquendo for the vacant title. His opponent, "Fast" Fres Oquendo, is one of the most experienced heavyweight contenders in the world. More than ten years ago "The Big O" challenger John Ruiz for the WBA championship. Even before that he suffered a controversial decision loss to IBF titlist Chris Byrd. "I should have been world champion back then. Now I finally get another chance and I will not let it pass", states Oquendo. On the undercard former WBC cruiserweight champion Juan Carlos Gomez will take on unbeaten Bosnian Goran Delic and German heavyweight prospect Edmund Gerber faces Mexico's Vicente Sandez for the WBC Silver International championship. Chagaev vs. Oquendo will be broadcasted live in about 100 countries worldwide. Former world champions Evander Holyfield, Lamon Brewster and David Haye are expected to attend the event at 30,000 seat Ahmat Arena as VIP guests along with actor Jean-Claude Van Damme and Steven Seagal.